Mod had several definitions in my generation, but my favorite is from the ’60s and ’70s, when guys would routinely spend their weekends and pocket money taking a beloved car and making it look or perform better—mod meaning modification. These guys didn’t drive the Alphas, Porches or Vettes. They drove whatever they could afford, from VWs and MGs to Cameros, Novas, and Mustangs if they were lucky. 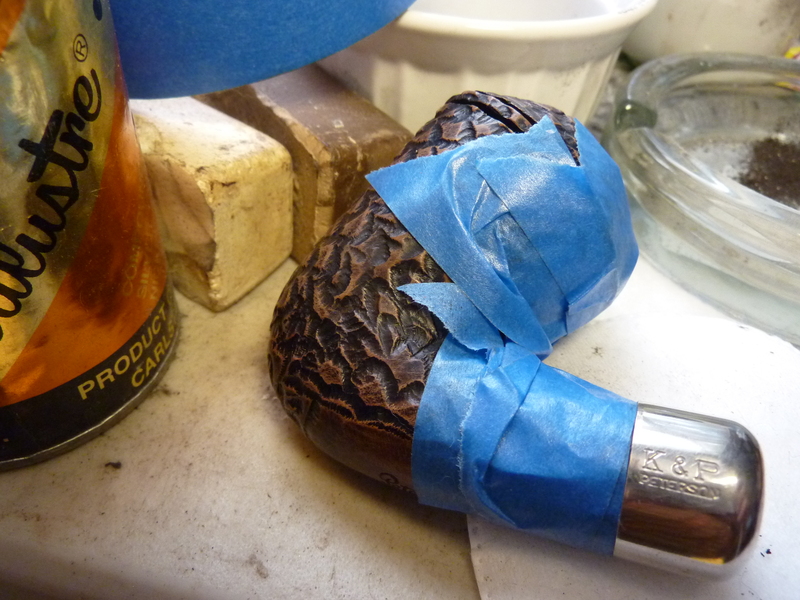 So, here’s a quick mod for a nickel-mount Pete to make it shine like sterling – almost. I thought of it over the holiday when I picked up my Derry Rustic, then set it down, vaguely dissatisfied. I picked up my 2016 Elf Army and found the same mysterious disappointment. 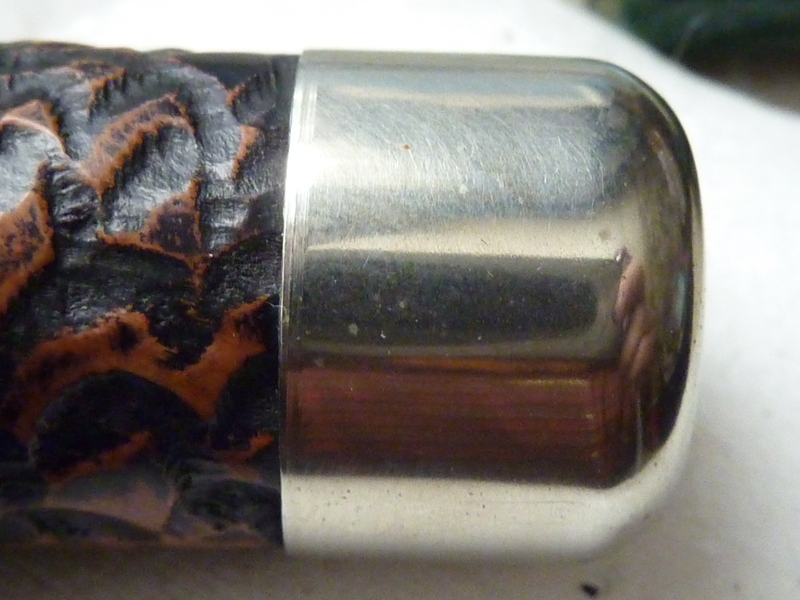 I don’t smoke pipes that don’t give me that spark of joy that marks a true pipe companion, and I thought, “Uh oh, what’s wrong?” They both smoke fine, even the acrylic f/t not being too bothersome, so what was the problem? As I held them in my hand, one after another, what I saw it as a disparity between the finish and mouthpiece on the one hand and the nickel mount on the other. Peterson’s nickel ferrules have had their ups and downs over the years. The pressed mounts, which came into use in the early 1960s, are outsourced, of course, and vary in their degree of polish by industry standards and by the era they were made. Sometimes you’ll see a System estate with a fairly polished mount, sometimes one that’s rough. The same seems to be true on new Petes. There’s different finishes and grades of nickel for varying applications, from refrigerators and toasters to automotive and medical equipment. I have no idea what grade Peterson uses, but it would be interesting to find out. The mounts on Derry Rustic and Elf Army I worked on for this blog are about average, neither better nor worse in their finish than previous years. That is, except for the bevel, which seems to have gone missing! 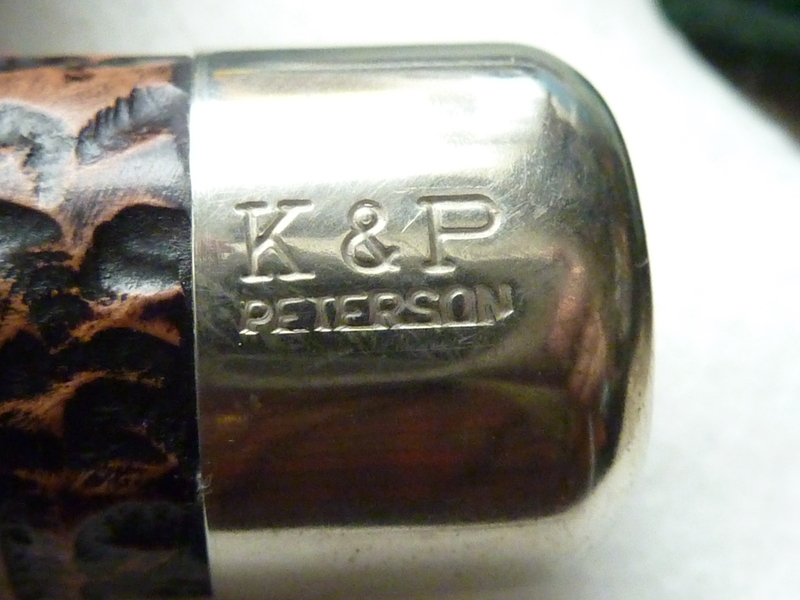 The bevel is that place at the end of the cup that laps over the briar, and in years’ past it was a hallowed tradition at K&P to make sure that it was turned down to meet the wood snugly. You can tell it’s there — sort of — in the following photo, but what there is doesn’t chase around the entire cup. 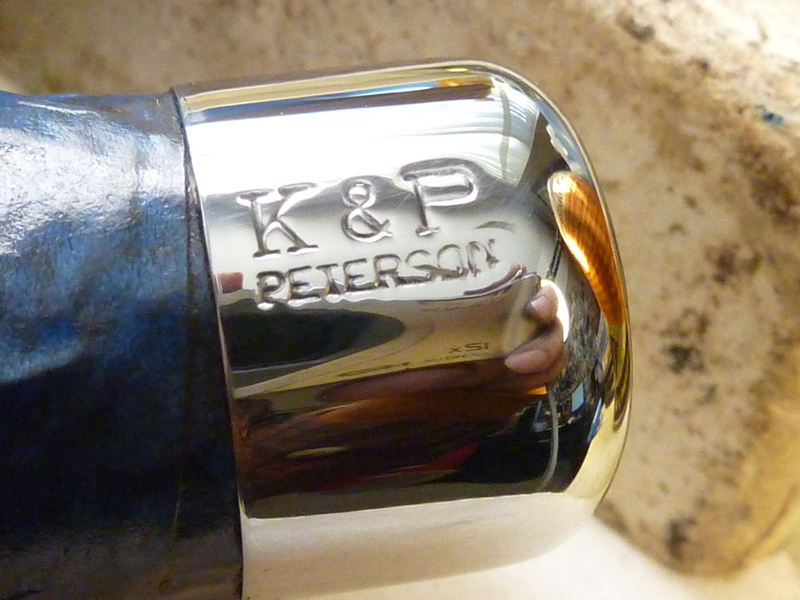 Peterson’s nickel mounts throughout the years are of a sufficiently high quality to take a much higher polish, albeit with the loss of a bit of the K&P over PETERSON stamping. 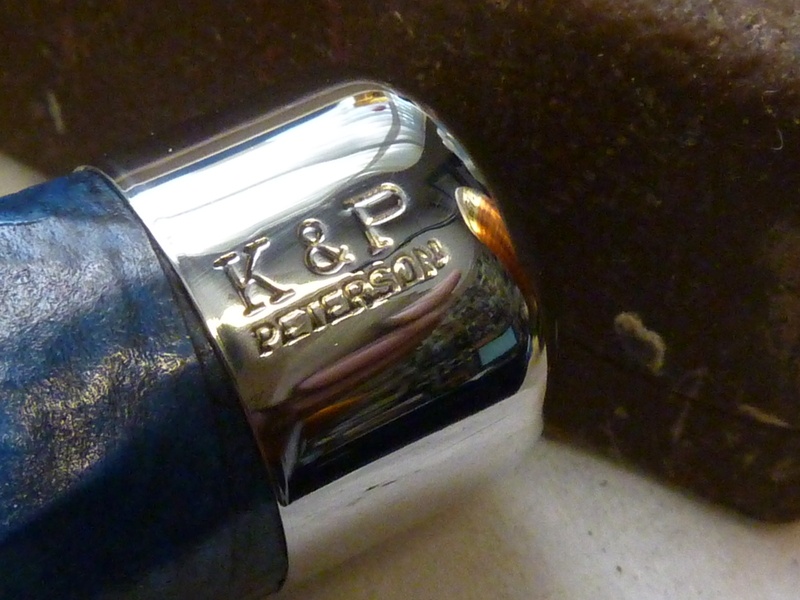 (That stamping, by the way, goes back to their earliest registered assays marks with the Goldsmiths of Dublin, and is just about the only place you’ll see “K&P” –Kapp & Peterson – these days on a Peterson pipe.) If you’re willing to sacrifice a bit of sharpness in the stamping for a near-sterling look, go for it, I say. Perhaps I should add that a true mod is not a grumble or complaint, but making good on an opportunity to make something you could afford just a little better than it was to begin with. You’ll need your buffer, perhaps some Tripoli (use sparingly, if at all), some White Diamond, and masking tape. The results you can see for yourself. Remember to give yourself plenty of play on the buffer. Too much taping can’t hurt. Here it is after the Tripoli (brown) compound. You can see how the Tripoli ate away a bit of the stamping, but what a difference it made for the mounting! I hasten to add that after reading this blog, my friend Al Jones cautioned against using Tripoli, as it can quickly eat right through the nickel. While this didn’t happen for me, I suspect it was just dumb luck on my part, and you’d do better to begin with the white diamond. And here it is after the White Diamond. Like I said, “almost sterling,” right? 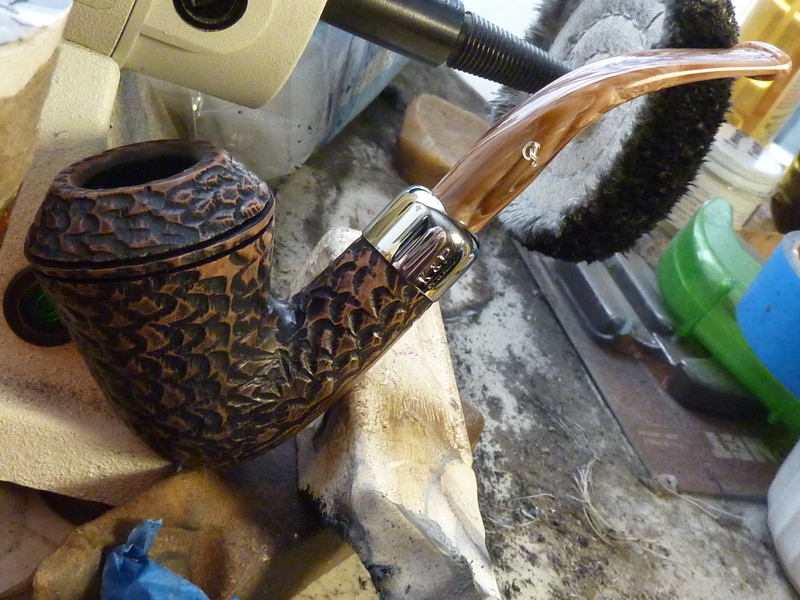 I have, among many other Peterson Pipes, a Derry B27. After reading this article I’ve re-examined the mount as well as those of others. While the edge at the end next to the shank is turned down it is not flush with the wood blow the rustication which would have made a better transition. I don’t pay any attention to the difference as I like the pipe an it is typical of this manufacturer. You get what you pay for and if the finish quality were of a higher grade the price would increase a well. I love my Peterson’s including what faults they might have. 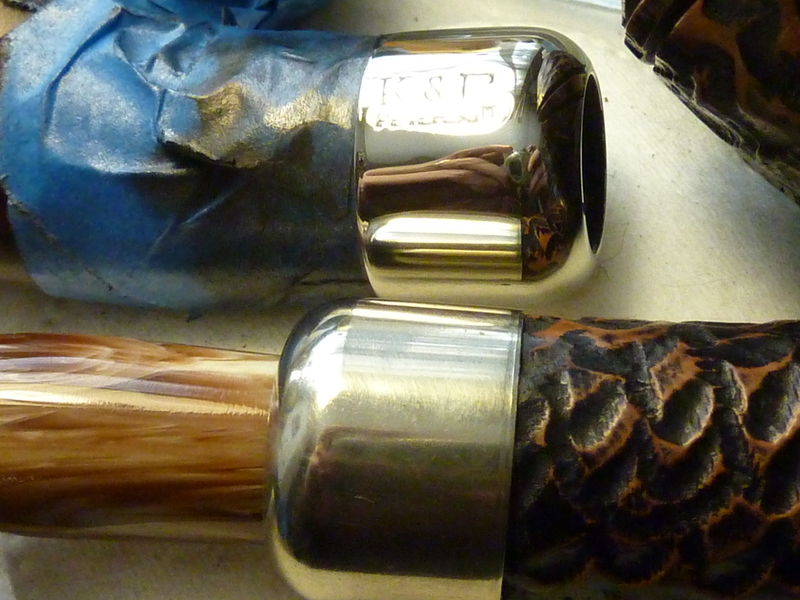 As for finishing, I don’t have any other way of shining the mounts other than silver polish, rags and ‘elbow grease’. Lots of rubbing seems to do the trick. Hi Tom! I wasn’t intending to point out the factory finish as a fault, just something that an appreciative hand could shine up a bit more, but you’re right, it takes a Foredom or similar type of buffer to do this work. My wife gave me one for Christmas several years back, hoping to keep me occupied, I think. It worked. Great idea, headed to the shop as soon as I send this note. I wanted to point out that when my stems start showing to much ware or oxidation I take them to the buffer using the blue compound and in just a few moments they look like new (other than my teeth marks). Blue compound? That’s new to me & I’ll definitely be looking for some. I’m always looking for a way to do this kind of work faster. Thanks! Great info on polishing the nickel mounts and ferrules. Thanks Mark. I cut my teeth polishing metal for motorcycle and auto parts. Please be careful with the Tripoli polish. As you observed, it is a “cutting” compound and quite abrasive. I don’t know the depth of the nickel plating, but I’d bet it is quite thin. To heavy a hand with the tripoli could remove it altogether. I recommend first starting with White Diamond, and see what results can be obtained. Thanks, Al! I have incorporated your caution, and it is well-received.